Labor pain can be intense, but you have options to help you cope — without medication, an epidural or spinal anesthesia. If it's safe for you and your baby, you may even choose not to take pain medication at all. At the Family Birth Center, we offer several natural and low intervention pain management options. Our new natural birthing suites are equipped with built-in warm water immersion therapy (hydrotherapy) tubs. For women who are in active labor, hydrotherapy can offer pain relief and other benefits prior to delivery. The water is kept at a controlled temperature to avoid dehydration. We encourage you to choose freely from our services and amenities for comfort and support during labor. Choose from a range of options to experience natural birth your way in a safe hospital setting. At the Family Birth Center, your care team will listen to your preferences, concerns and questions, and respect your childbirth choices with compassion and expertise. 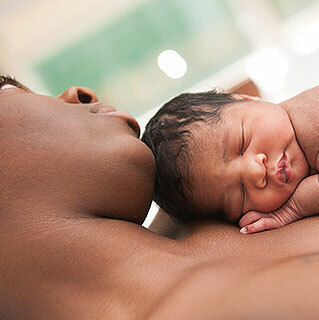 With expertise in evidence-based practices, personalized prenatal care, and hands-on labor support, our certified nurse midwives play a unique role in optimizing birth experiences.